Our marketing department was only recently notified that, at least in the UK, people celebrate National Sausage Week at the beginning of November. Thanks to Apryl at Blue Daisy Glass, we now know what we’re missing. In the US, we traditionally laud hot dogs for the entire month of July and eat accordingly, but that leaves out a whole world of encased meats. 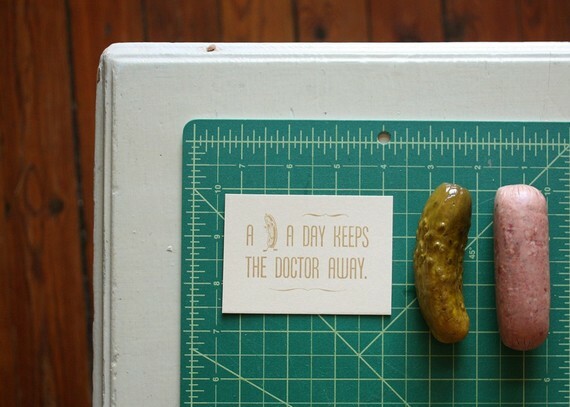 Let’s all raise a sausage/pickle and toast to a great week! Slow Industries Becomes Even Slower! Here at Slow Industries, we’re scrambling (but not that quickly or efficiently) to finish a few projects before beginning the new and intense project of having a baby. Since there are currently no photos available of the projects that are being completed, we thought you might enjoy this photo sent to us by our friends Paul and Lisa over at Driving Inertia. 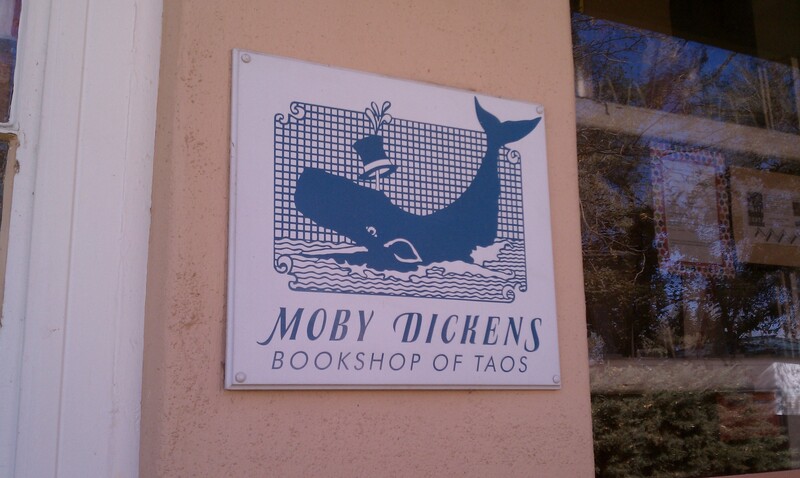 As good a name for a baby as a book store? You tell us. 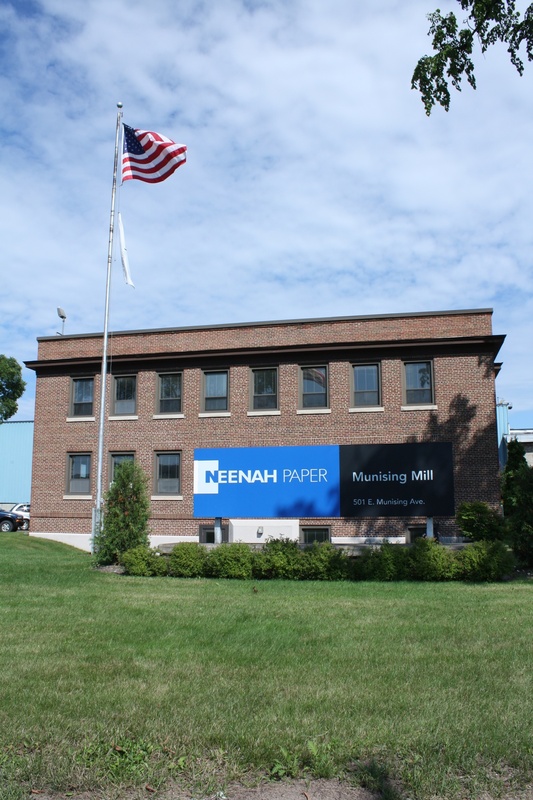 More Chicago Artists Month Fun! Have you celebrated Chicago Artists’ Month yet? If not, here’s another opportunity – and a delicious one at that. 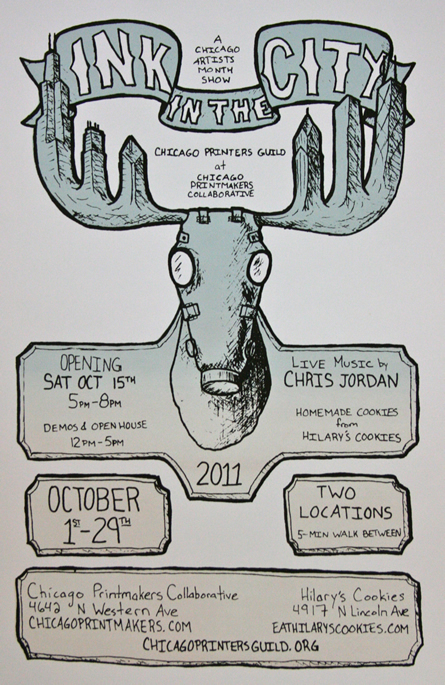 Enjoy good prints and good eats at the Chicago Printmakers Collaborative on Saturday, October 15th, from 5-8pm. Ink in the City features work by members of the Chicago Printers Guild as well as cookies from Hilary’s Cookies (and all the participating printmakers). How can you go wrong with prints and dessert? Slow Industries will definitely be there, literally eating cookies and as represented by two prints from the Creep collection. Come and join in the fun! Sure, the fun of summer in Chicago is just about done, but there’s plenty to enjoy during the month of October before the coldest winter ever starts up in earnest. At the very least, you have the Halloween candy fix and Chicago Artists Month to look forward to. The upcoming Friends of Transit Print Invitational focuses on all things transportational and travel-related, and runs from October 1 — 30, 2011, with an opening reception Friday, October 7th, from 6–8:30pm at I Am Logan Square’s new gallery space. 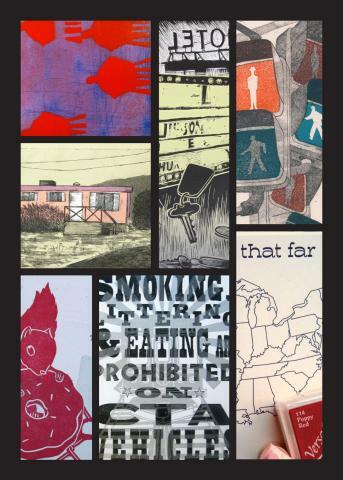 Check out Slow Industries’ urban aphorisms postcards, as well as work from our printmaking colleagues at Monkey Rope Press, Moongirl Productions and Rar Rar Press. As you can see from this photo, even though letterpress printing can be cruel, whimsical and painstaking, the results are well worth the effort and bring smiles to the faces of everyone who has survived the process. 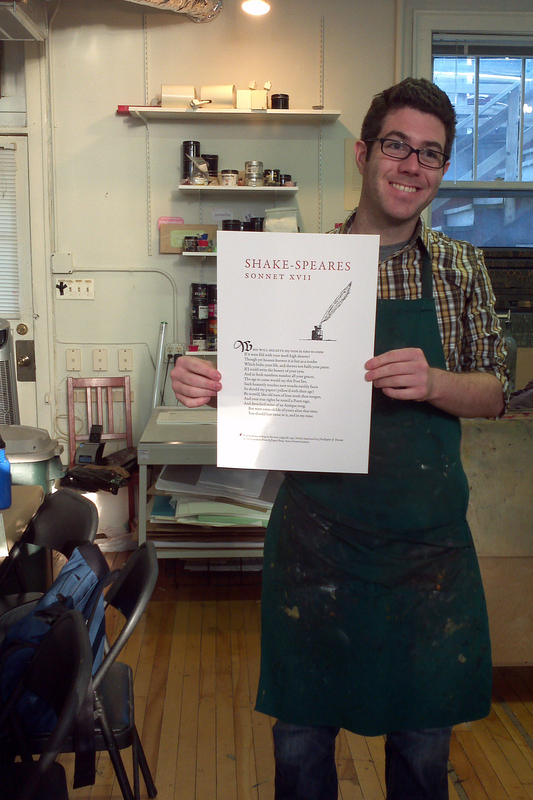 This past weekend, our education outreach coordinator finished teaching a two week “Broadsides for Poets” workshop at the Evanston Print & Paper Shop. Three industrious and talented participants picked great poetry for their broadsides and really made the most of the class. Here’s our very appealing Renegade set up. The stroller that we set just outside the tent, complete with that delicious-looking half-eaten donut, really drew in the big crowds. 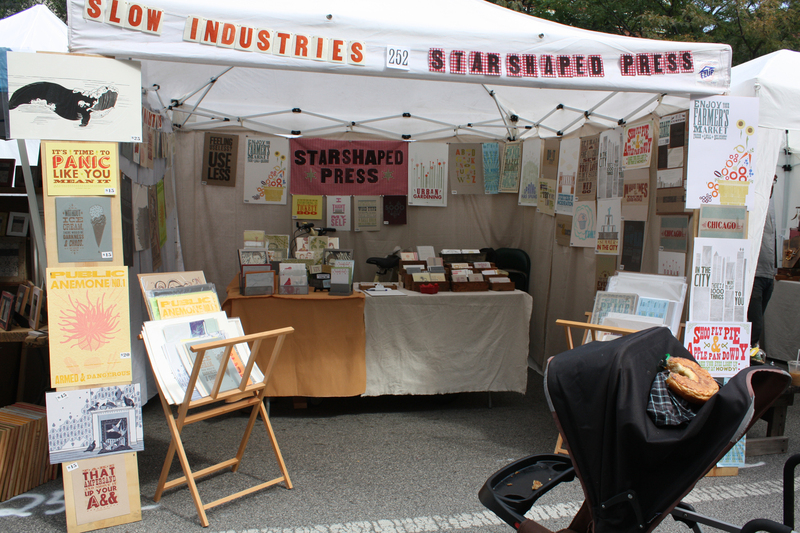 We were sharing the booth space, as you can see, with the always awesome Starshaped Press. Come and visit Slow Industries at the Renegade Craft Fair this coming weekend! We’re at booth 252 (we think..) and will be around from 11-7 on Saturday and Sunday. In addition to our fine wares, you can buy just about anything handmade at this gargantuan event. There might even be ponies, but no promises. Isn’t it so true that some things can only be combated (or cured) by a healthy serving of ice cream? 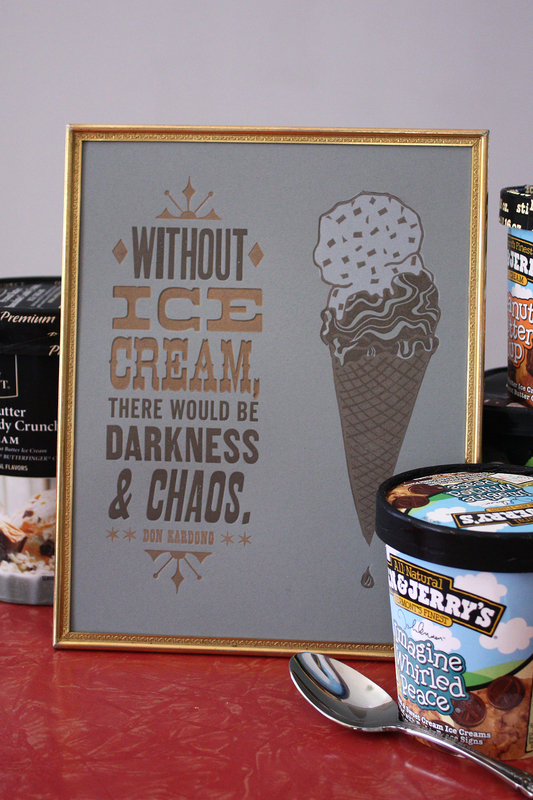 Slow Industries’ newest print features a quote from famed runner Don Kardong, who clearly views the consumption of ice cream as a moral imperative. 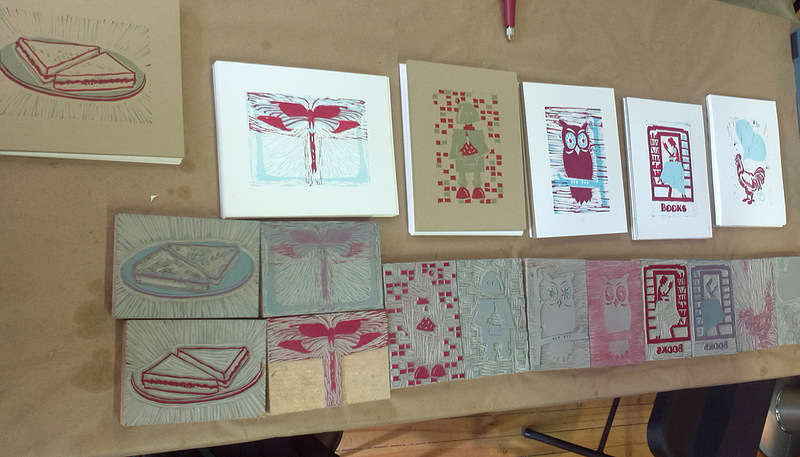 This past weekend, Slow Industries’ Education Outreach Coordinator, Sarah Vogel, taught a two color linocut class at the ever popular Evanston Print & Paper shop. And what a class it was! Six industrious workshop participants carved and printed like crazy to finish six pretty amazing prints. Read on for more pictures and stats!